I will be going on a 3 night trip to horseshoe mesa the first night then on to Hance creek area for two night the first few days of May. There will be 3 of us and this is our first backpacking excursion into the Grand Canyon. I would like advice on what type of wether to prepare for and the best way to hike the Hance creek watershed. Other questions: Will a tent be neccessary? What quantity of water will be required to make the trip up from Hance creek? The Grand Canyon Skywalk opens in one month. Are you ready for the Skywalk? Is the Grand Canyon ready for the Skywalk. An article in today’s LA Times surveys a variety of opinions about the Skywalk’s impact on the Grand Canyon experience. (Find more Grand Canyon Skywalk news here. )What do you think about the Grand Canyon skywalk? Share your thoughts in the comments. Experience hiking the Grand Canyon through Tim Osborn’s eyes. Enjoy Tim’s Grand Adventure. Have a trip report? Share it with us! The canyon is a tough subject to photograph. The vast expanse simply doesn’t translate well to two-dimensional representations. None the less, that inspires many of us to capture the essence of the canyon anyone. Improve your odds of keeper canyon photos by checking out my How to Photograph the Grand Canyon, if you haven’t done so already. While I advocate seeking the unique vantage point. I strongly discourage mimicking what this guy did. The risks are just unacceptable. Enjoy Mark Boyer’s trip report of his rim-to-rim hike and additional explorations of the Horseshoe Mesa area. The report is in PDF format. On November 16, 2006, a Grand Canyon Park flight crew located a vehicle approximately 600 feet below the rim in the Abyss. One body was also recovered. Here’s a video of the vehicle being airlifted out of the canyon. Attempting to drive below the rim is not recommended. 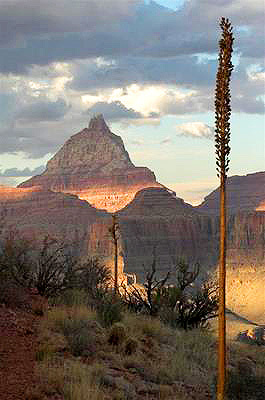 Jim Karsh recently explored the Horseshoe Mesa and Hance Creek area. Check out his photos. Have you canyon trip photos to share? Let us know! Greetings! We’d love to hear from you. Leave a question, query, or tip as a comment to this post. By the end of this year, the answer will be the Grand Canyon Skywalk — a glass bridge that is being built on the edge of the canyon on the western rim. Part of Grand Canyon West, a destination owned and operated by the Hualapai Tribe, the Skywalk was originally set to open in January but is now scheduled for completion by midsummer and will be open to the public by the end of the year. “Tourism is our only means of self-sufficiency, of our people coming out of poverty and social problems,” said Sheri Yellowhawk, chief executive officer of Grand Canyon West. Last year, about a quarter million people visited the area located on the west rim of the Grand Canyon. The Hualapai tribe owns 1 million acres of land with 108 miles of that along the rim of the canyon. Yellowhawk said although the land-use plan designates 9,000 acres for development, only 11 percent of the land within that 9,000 acres will actually be developed. She said once Grand Canyon West is at total build-out — in approximately 10 to 15 years — the area will draw between 3 million and 5 million visitors a year like the south rim of the Grand Canyon. It will be interesting to see how this evolves relative to those plans. Ken McNamara and Rob Kleine are coauthors of Hiking the Grand Canyon: The Corridor Trails, the definitive video on Grand Canyon Hiking, and creators of GrandCanyonHiker.com, a compendium of tips, tools, and resources for Grand Canyon hikers.